Previously we had advised that the three segments at the top of the patch were for the bronze, silver and gold levels of membership. We have been advised that these patch segments are not affiliated with the Knights of Yawgoog are are earned as part of the camp program - see below. Segments with the numbers, 1, 2, 3, 4, are for years at Yawgoog. A "V" segment is given for veteran and of course 5. There now are year segments extending from V (Vertern/5 years) to 10 years. Segments have V-# (6-10) on them. 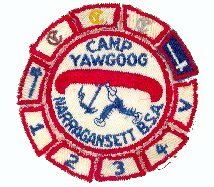 The CY program requires Scouts to learn the History of Yawgoog, do a service project for the camp, be a certain rank, and participate in the camp program. There are bronze (shown below), gold and silver versions of the CY program. You can not earn more than one CY in any single year. 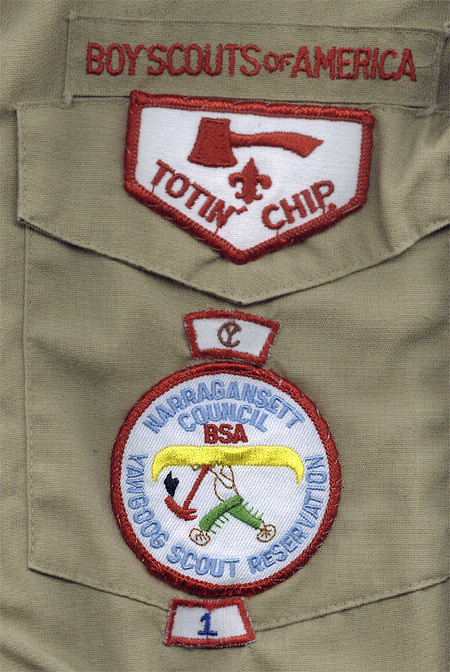 A 1990's version of the Yawgoog patch is shown below with the bronze CY and 1 year segment.